Part of the draw and charm of the Nintendo Switch is the increased focus that it puts on local multiplayer. Nintendo has always been the king of that style of play, but the Switch takes this to a whole new level when you combine the portability factor with at least two controllers that are always ready to go. Though there are already plenty of games on the Switch eShop that take advantage of this multiplayer functionality, Overcooked: Special Edition is definitely one of the best uses of it that we’ve seen so far. The premise is silly and unimportant, but it adds a good amount of charm to the overall tone. The game opens with asteroids raining from the sky and a city under assault, with your cooks watching the chaos with the Onion King from a kitchen on a roof. Not soon after, the source of the apocalypse — the mighty spaghetti monster — storms over to the cooks, and it’s quite hungry. Despite your best efforts at feeding the monster it simply isn’t enough to sate its ravenous appetite, so the Onion King opens a time portal that you escape into. The portal opens up in 1993 — several years before the coming of the spaghetti monster — and the Onion King tasks you with travelling the land so that you can be ready when the apocalypse comes. Aside from occasional visits to the Onion King, the story mostly takes a backseat from that point on, but it nonetheless does a good job of setting up the “why” as you find yourself in increasingly more ridiculous kitchens and scenarios. 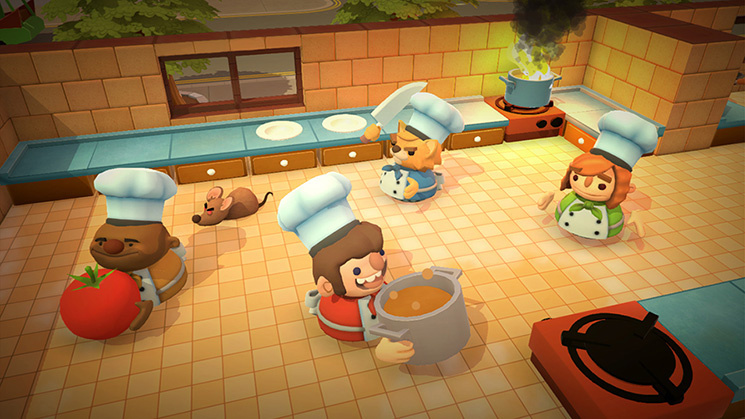 Gameplay is extremely frantic and stressful — in many ways emulating the real experience of working in an understaffed kitchen — yet it’s some of the most fun couch co-op we’ve experienced in quite some time. Each stage will see you working to output as many orders as possible under a set time period, making everything from soups to pizza. Each kitchen’s layout is different and there’s a process to producing things. For example, in order to produce an order of tomato soup you have to run over to the tomato box, then run over to a board to cut up the tomatoes, then run over to a pot to cook them in, then put it in a plate and run it out to the window. That would be enough as is, but the difficulty comes from how limited your abilities are. You can only be carrying one item at a time, and you can’t move around everything in the kitchen to expedite things. Sometimes the cutting boards might be in one room and you have to walk through a portal or cross a river to get to the fryers. Sometimes there’s only three plates to work with in total, so someone will have to keep doing the dishes to keep up with the orders. You only have so much control over how efficiently each kitchen can be run, and many of them are often intentionally made to be as frustrating as possible. 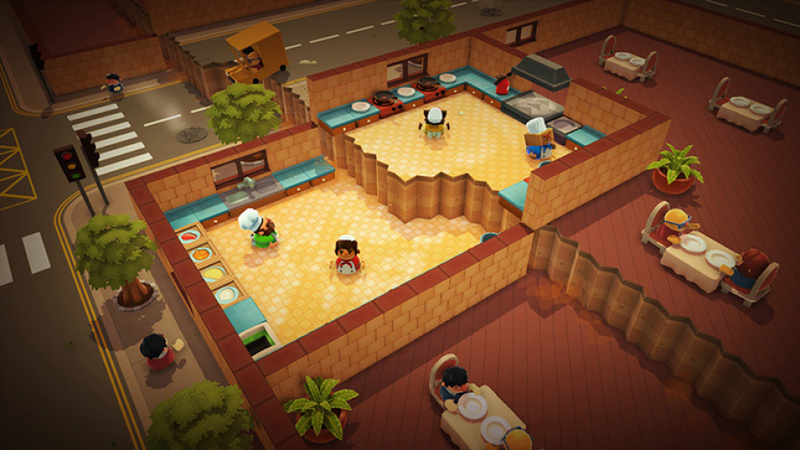 The game is completely playable in single player — difficulty is turned down greatly and you can switch between cooks at the tap of a button — but the real fun comes when playing with others around you. Whether playing with full controllers or taking a Joy-Con each, the controls are simple to pick up and easy to use. Kitchens are often designed in asymmetric ways, and so your success or failure will almost entirely depend on how effectively you can communicate with your friends. As the orders keep rushing in you’ll have to be constantly asking each other to pass ingredients, or to pull out the pizza before it catches on fire, and it doesn’t take long until everyone in the room is shouting demands and curses at each other as you all barely manage to keep your heads above the never-ending demand. Even so, the goofy visuals and chaotic nature of the gameplay lend themselves to plenty of laughter, as you sometimes fail spectacularly. It’s that dynamic kind of gameplay that proves to be this game’s biggest draw. No two stages are exactly alike, and the gimmicks grow increasingly more ridiculous as you progress deeper into the game. Even so, the orders that come in for each stage are randomly generated each time, so replaying the same stage multiple times can still lead to vastly different experiences. There’s a great deal of satisfaction, too, to be found in finally mastering a stage by figuring out the most effective method for getting past certain bottlenecks in the process. Each kitchen will give you up to three stars based on how many orders you made, how quickly you got them out, and whether or not you failed to get any out on time, and that coveted third star can be heinously difficult to achieve in some stages. As for presentation, there’s something left to be desired on the performance side, but the visuals and audio are spot on. The colorful visuals have a cartoony, silly look, and the game sticks to a lighthearted atmosphere; you can be rushing around the kitchen as a small dragon or a raccoon in a wheelchair, if you wish. The soundtrack can get a bit repetitive at times, but it keeps to high tempo tracks filled with accordions and guitars to match the quick pace of gameplay. 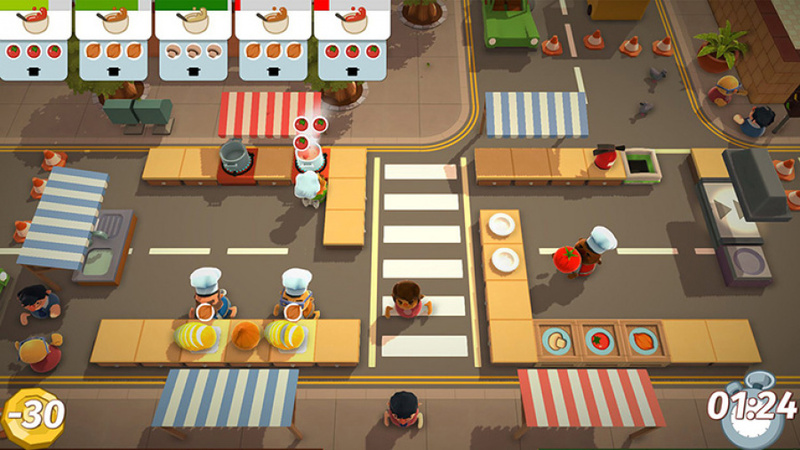 HD Rumble is uitilized here, too, and is especially helpful in single player for keeping you aware of when the other cook is done chopping something up, but it otherwise isn't a very notable or impactful part of the game. Ultimately, you won’t really notice the visuals or music all that much, as you’ll be too focused on keeping up with food orders, but you likely will notice the framerate. Versions on other consoles seem to run at a fairly consistent framerate, but the Nintendo Switch version rarely manages to hit 30FPS, usually oscillating somewhere around 20-25FPS regardless of whether you’re playing docked or undocked. This has an effect on gameplay, as you’ll sometimes drop items or miss picking them up because the game jumps or stutters. Considering that the game isn’t all that visually intensive this just comes off as being a bit sloppy on the developer’s part, although at the time of writing work is apparently underway on a patch. In terms of replayability, there’s plenty of meat here for you to sink your teeth in. The main campaign has dozens of stages, which will take quite some effort to achieve three stars in. 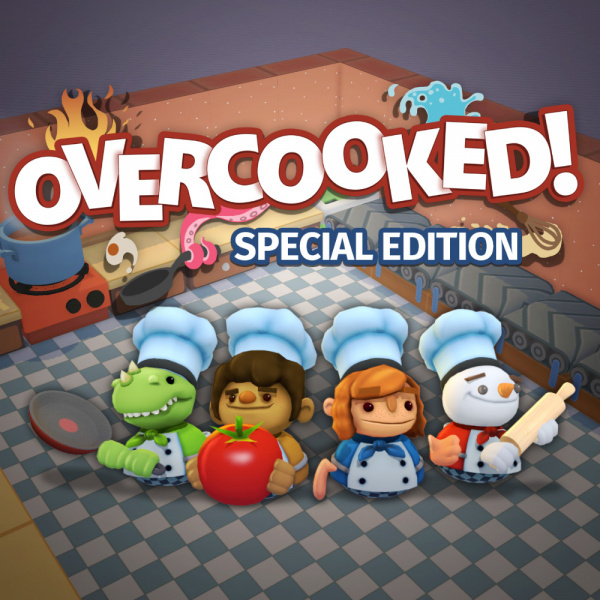 Beyond that, however, Overcooked: Special Edition also includes two DLC expansions that came to earlier versions, and these nicely build on the initial game and offer plenty of innovations and stage gimmicks of their own. 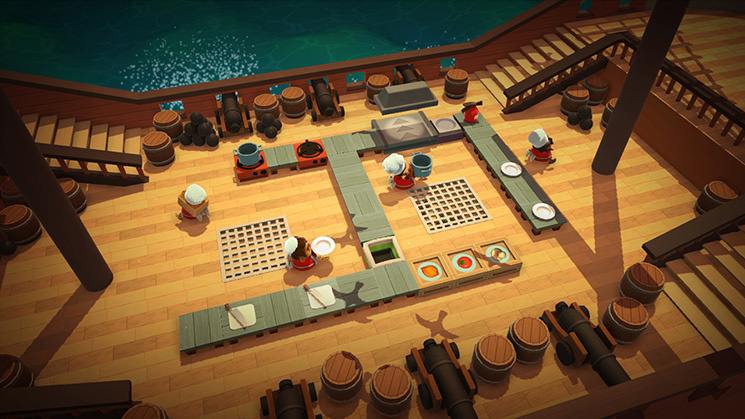 Suffice to say, it’ll certainly take you a while to see everything Overcooked has to offer. All in all, Overcooked is an absolute must-buy for anybody looking for a fantastic party game to play with friends. The wacky visuals and chaotic gameplay make it an ideal game for local co-op, and there’s plenty of content to work through. Although there are some disappointing launch issues with the framerate (reflected in our scoring), we still give this one a strong recommendation overall; it's a title that perfectly nails what makes local multiplayer games so fun. I may pick it up eventually. People seem to like it a lot. I'm enjoying it, however it's competing against Miitopia, Hey Pikmin, Braintree Training, Ever Oasis, and Splatoon for my time (as well aso real life). Crazy times for Nintendo fans with so much choice! Got this for when I have friends over. Great game! Not my taste, though a little video attached to this review could have helped. Now if only Team 17/Playtonic would give us Yooka -Laylee! I'm looking forward to getting this, but only after it's been patched to hit a constant 30fps. So it's not undercooked. Though the framerate needs improving which hopefully the patches will fix. I don't buy games that need a patch to work correctly. I only pay for a quality finished product. At my house we have a saying, "if you're going to do a job, do it right the first time". @thesilverbrick I'd say it's the most fun co-op game I've played that I can remember - especially for casual/non-gamers. I am disappointed in the framerate issues though, and I really hope they are fixed soon. @Bengals76 So what you're saying is that you don't play games anymore, since almost all games get patched at some point these days. Even the Best games ever still have some flaws. Games are not created by God. @roadrunner343 Thanks for the recommendation. I'm probably going to cave and buy it sometime this week, since I'm having a bunch of company on Sunday who might enjoy playing it. The framerate issues probably won't bother me too much in a game like this, plus if links to articles in this comment section are to be believed, a fix is on the way. Interesting to see frame rate issues in quite a few different games on Switch. Most have been patched and fixed, but maybe Nintendo needs to help the devs with that earlier to avoid the launch problems and perception of Switch being "under powered" for indies and the like. @thesilverbrick I should have specified, that when I said it was one of the most fun games I could remember, I was playing on Steam with my wife and another couple. I also player through it with just my wife, but I would say 3-4 players is where this game really shines. Unfortunately, the Switch framerate issues are nearly a deal breaker to me (I'm very sensitive to frame rate) but I wanted to pick it up before I went on a vacation with my parents/younger brother & his wife later this month- I think it will be great to play with them, even with the framerate issues. Maybe they'll be fixed by then. @roadrunner343 Good to know. My wife and I usually have somebody visiting at least a couple nights a week, so we should have plenty of opportunity to play with at least three people. Looking forward to trying it out. Is the singleplayer campaign fun enough to be worth the 20? Bought it day 1. I like it a lot... but not as much as my laaady, who keeps asking me every evening if I wanna play. Precisely what I was gonna say ! Also means you didn't play through the 8-bit and 16-bit era if framerate issues are a disqualification motive. Suprised this got an 8 with frame rate issues. @faint In the Korok forest the frame rate still drops so much it basically looks like a completely broken game when you're near the Master Sword platform. So depressing. @krvstkvlt I would say so, there's still a good bit of fun to be had, but this is definitely one to buy for the multiplayer. I think I watched too much of Cow Chop play this game. I feel like I've seen all it has to offer. @Dang69 that wasn't the point I was making. I've been playing this game with my fiance and we absolutely love it. She's picked it up pretty well too, considering she's not a massive gamer. Thankfully I took the Switch camping last weekend, we got stuck in the tent for a few hours during heavy rain and this saw us through perfectly! Frame rate did cause a few issues trying to pick up items, but nothing unbearable I'd say. I'm sure a patch is on the way. Me and my daughter love playing this together! We aren't as sensitive to frame rate as others, but I'm sure when a patch drops we'll enjoy it even more! The performance issues should drop the score even more. If the get it to run solid 30 fps, then 8 seems about right, but as of now I'd say it's a 6. I like the game a lot, but it's not very fun running all jerky. My non-gamer wife loves to play this with me, along with Puyo Puyo. Overcooked is super fun though so I dont mind. The other day the two of us played with my brother and we were all literally crying with laughter. By the way...framerate shramerate. Who cares? I never used the word perfect, you did. I never said that, and without a question mark at the end of your sentence, you're making a statement, a statement that I never made. I did buy it, but only after it was a quality working product. You said that you do not like games that need a patch to play correctly. In this day in age, that would be almost every game out and has been the case for years, hence my comment. That may not have been what you meant, but it was still what you said. This game stresses me out too much. My girlfriend enjoys it, always asking me to play, but I just can't manage being timed and having to think about 5 things at once, lol. I always half expect for Gordon Ramsey te pop up on screen. I don't buy games that need a patch to work correctly. I only pay for a quality finished product. I will let you buy the shovel-ware. You will keep getting what you pay for. @Bengals76 Which is a rough stand to take, since it means that you can't buy almost any game anymore since all games get patches to "work properly". A better position would be to not purchase games until after they have been patched. Your statement proves you from even getting the latest Zelda game since even it needed patches to work properly. @Captain_Gonru Ah, good catch! Yes, I meant asymmetric.